From Wikipedia, the free encyclopedia. Shahrukh Khan ( born 2 November 1965), often credited as Shah Rukh Khan, is an Indian film actor and a prominent Bollywood figure, as well as a film producer and television host. Khan began his career appearing in several television serials in the late 1980s. He made his film debut in Deewana (1992). Since then, he has been part of numerous commercially successful films and has earned critical acclaim for many of his performances. Khan has won fourteen Filmfare Awards for his work in Indian films, eight of which are in the Best Actor category (a record). In 2005, the Government of India honoured him with the Padma Shri for his contributions towards Indian Cinema. Khan's films such as Dilwale Dulhaniya Le Jayenge (1995), Kuch Kuch Hota Hai (1998), Chak De India (2007), Om Shanti Om (2007) and Rab Ne Bana Di Jodi (2008) remain some of Bollywood's biggest hits, while films like Kabhi Khushi Kabhie Gham (2001), Kal Ho Naa Ho (2003), Veer-Zaara (2004), Kabhi Alvida Naa Kehna (2006) and My Name Is Khan (2010) have been top-grossing Indian productions in the overseas markets, making him one of the most successful actors of India. Since 2000, Khan branched out into film production and television presenting as well. 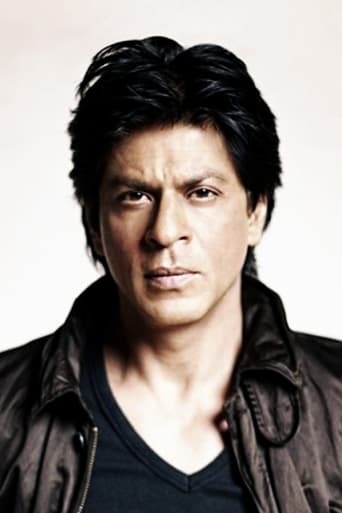 He is the founder/owner of two production companies, Dreamz Unlimited and Red Chillies Entertainment. Known globally to his fans as SRK, Khan is considered to be one of the biggest movie stars, with a fan following numbering in the billions and a net worth estimated at over Indian Rupee ₹2,500 crore (US$555 million). In 2008, Newsweek named him one of the 50 most powerful people in the world. Description above from the Wikipedia article Shahrukh Khan, licensed under CC-BY-SA, full list of contributors on Wikipedia.